Considering that I can neither see, taste, nor smell the parts that make me sick, I’m gonna go with No. I’ll just eat the stuff I know is safe for me, thanks. Would you please tell that to my gut? It still hasn’t clued in on this concept. The last time I thought that, I had the most horrific bathroom problems for three solid days, I didn’t sleep right for about a week, had awful Depression that whole time–which cleared up once the gluten got out of my system–and was losing nutrition in my body for that entire time, since my GI tract was so inflamed that it couldn’t absorb anything, thereby throwing my body into starvation mode, no matter how much I did or didn’t eat. I had brain fog for a week, where I just couldn’t think, and I could barely function at my job. I had insomnia and fatigue at the same time, and during all of that, I was driving on the same roads as you. But hey, you know what? Thanks for your expert advice, and congratulations on your new medical degree. I’m sure you’ve been studying up on this WAY more than I have since my diagnosis three years ago. You made this for me? You thought me when you didn’t have to? I’m so grateful I could burst into tears. Thank you. Thank you so much! 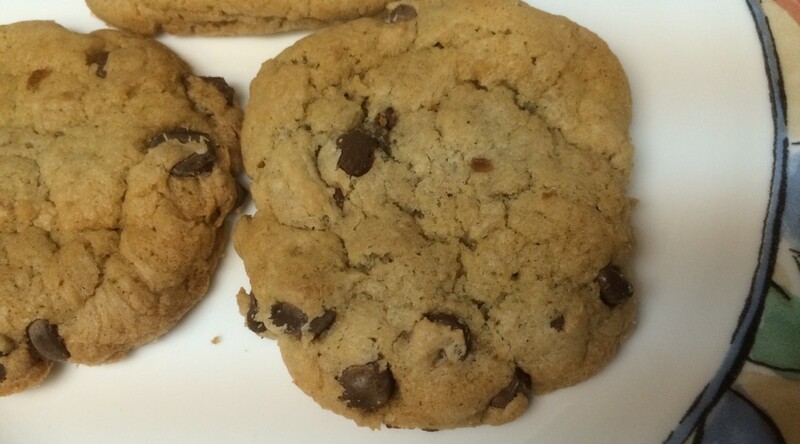 It’s just…before I take a bite, did you check all of the other ingredients, too? Besides the most obvious ones? Your marinade was made with soy sauce, whose second ingredient is usually wheat. And this has white vinegar in it, which could have been made with malt (barley), but we have no way of knowing–sometimes even the manufacturer doesn’t even know. And you’re right: oats are naturally gluten-free, but here in the states, oats are stored, transported, and processed in the same facilities as wheat, rye, and barley, which means by the time they hit the shelves, it is entirely possible that the oats have more gluten ON them than wheat has IN it. I know, this is weird and gluten has no business being in these things, but it is. Welcome to my world. It took me about two years to find all the hidden ways gluten was still sneaking into my diet. I don’t expect you to pick it all up in one afternoon. But what that means is that while I am SO GRATEFUL that you brought this dish with me in mind–seriously, you have no idea!–I cannot safely eat it. Unless it was prepared by someone who understands what gluten is and where it hides, I don’t want to eat it. But thank you so deeply for thinking of me. Oh, gods. Another one? Why can’t I eat a normal meal like I used to? So sick of salad. This party is full of the most amazing foods. I mean, the smells alone are sending me into heaven, and breaking bread together is such an important part of human community building, and I so want to take part in that. I’m not on a diet. You guys are all eating these fried/breaded/baked delicacies, and I wish I could have just one more bite, one more taste of golden, greasy goodness, to share in the communal offerings… But not even one bite is worth the health risks I’m facing. I don’t want to eat myself into dying from malnutrition or even just having bones so brittle they snap under any stress. I don’t want to get osteoporosis or anemia. I’ve seen what that does to people. I don’t want to lose so many nutrients that my hair falls out or I can no longer think straight. And I really don’t want to spend the next three days in the bathroom. Besides, checking the salad dressing you’re offering, I see that it was made in a facility where the manufacturer cannot guarantee that some wheat didn’t get into the mix, meaning this stuff may be horribly contaminated for me, even though you cannot tell the difference. This means I get to eat my veggies raw. Again. But there is literally nothing else here that is safe for me, so Salad would be lovely. Thank you for thinking of me. Since that time, I have worked as an editor, myself, as well as an admin upon which various executives relied for fixing their memos. I also spent a good chunk of time with blossoming writers, as well as growing my own writing career– and from direct experience, I learned how to pinpoint parts of a manuscript that need to be tightened, yes, but also to point out where a manuscript is strong, so that writers know to keep doing that. In other words, over the years my father’s red ink has served me well, and now it will serve me once again. I have set out a shingle as a freelance editor specifically for small- and independent-press fiction writers. This is very exciting for me, because I get to do two things that I love: read and support blossoming writers and geek out on grammar and spelling a bit. If you are interested or just curious about my services, you can check out my editing services page here. And meanwhile, I’ve got a gig, so if you don’t hear from me for a bit, it’s because I’ve got my red pen out. A while back, Arcana and I went to see Wicked, which is a retelling of her favorite story, The Wizard of Oz. We talked a little bit about how even though the world is the same, the characters are the same, she considers them to be entirely different stories. I understand completely, because I’ve been saying for years that I consider the original Star Wars trilogy to be a different story from the full six that are currently out. (The OT is Luke’s arc, the full six is Anakin’s.) But the whole thing got me to thinking about remakes, reboots, and retellings. There was a time not so long ago when the only access common folk had to “the media” were stories and songs shared by the fire after a long day’s work. If a man was very lucky (or wealthy), he might have a couple of books to read, but most stories were shared orally. Occasionally, a performer would come to town and share their stories, songs, and news from afar in a live performance of some sort, but pretty much it was just regular people telling tall tales to anyone who would listen. As you can imagine, these stories would change from telling to telling. That’s what happens when people tell stories– they change. We embellish, we alter to suit the needs of the current audience, and we dismiss the details that no longer suit us, adding new ones that are more fitting. This used to be expected, relished, even. How will big that fish be this time? And in the retelling, the story would grow and become more meaningful to its audience, who would then want to hear it again, to enjoy once more. Eventually the best stories were written down, and then the printing press came along, and the written versions were more and more available to virtually anyone. Then came recording sounds on wax cylendars. And not long after, moving pictures captured first on film, then on tape. And now we have the digital age, with its bitstream highways and byways. Suddenly (within the terms of humanity as a whole) our stories are frozen in time. There is no longer a need to have Grandpa tell us the story at the hearth each night. We can access our media whenever we want. The same storyteller tells the same exact story the same exact way every single time. Every single time. Of course it’s a revolutionary way of sharing stories! Everyone across the globe can share in the same tale, told the same way, no matter where the storyteller was born. New vistas! New challenges! New adventures! Right here, in your home town, told as no one who lives here could. To people who weren’t raised in this environment, the whole set up is truly mind-boggling. Hell, it boggles MY mind, and I was practically born with a keyboard in hand. That doesn’t make it perfect, however. Don’t get me wrong. I LOVE watching movies over and over. I’m as bad a two-year old. Ask Honey how many times I’ve had a Lord of the Rings day (about to become a weekend, as soon as Smaug gets his boxed set– even if the whole thing is two movies too long.) Or how many times, I’ll flip through our disc library and croon about how much I love this one and this one and this one and OH! this one…. But still. People get so STUCK on how things should be, how awful remakes are. Don’t remake that one, they did it right the first time. Or Why did they reboot it? It was perfect the way it was. Or how about, Geez, Hollywood doesn’t have any creative ideas. They just keep revisiting the old stuff. I know. I used to be one of these people. But then came the Clooney/Pitt version of Ocean’s Eleven (I know it was a while ago, but go with me here), and I realized that this version actually improved on the Rat Pack’s original vision. Granted, Sinatra didn’t offer much time for artistry (legend has it each shot was allowed only one take), but the story, it turns out, is solid. And it was actually improved by a new storyteller, a new set of details (and a new budget). Then I saw the Karate Kid reboot WHERE HE DOESN’T EVEN LEARN KARATE WTF??? and I was off the band wagon again. And yet. Somewhere along the line, it struck me that kids today would no longer be able to relate to Ralph Macchio. He’s no longer one of Today’s Youth. He’s a relic of a time before these kids were even born. (No offense, Ralph. For what it’s worth, I am too.) And while bullying is still an issue today, the life that Daniel-san lived was different. No cell phones, no computer; social media was going to a movie with your friends. Homework was written and handed in, rather than typed and emailed. A story that doesn’t have a relatable hero will die. If no one can connect with him, his motivations, or if his life is just too foreign, an audience will lose interest and drift away, especially in our current “what have you done in the last five minutes” culture. What I find fascinating is that this evolution is still expected and even demanded in one current form of storytelling: live theatre. Each director has his own vision, as does each actor, each costume designer, each lighting designer. You can go to a hundred performances of Midsummer’s Night Dream, and reasonably expect to see an entirely different show each time. Some of that is because of the live factor. An actor may forget a line or play with an audience a little bit more one night than another. And even in theatre, it is understood and expected that not every night will Hit It, even with the perfect cast, the perfect crew, the perfect audience. Sometimes, the stars are simply crossed. But it’s also because theatre people understand that in order to connect with their audience, they must be interactive rather than operating by rote. Come to think of it, music artists get it too– how many Grammy awards have been handed out for “I Will Always Love You”? And I think that Hollywood gets that concept, too. 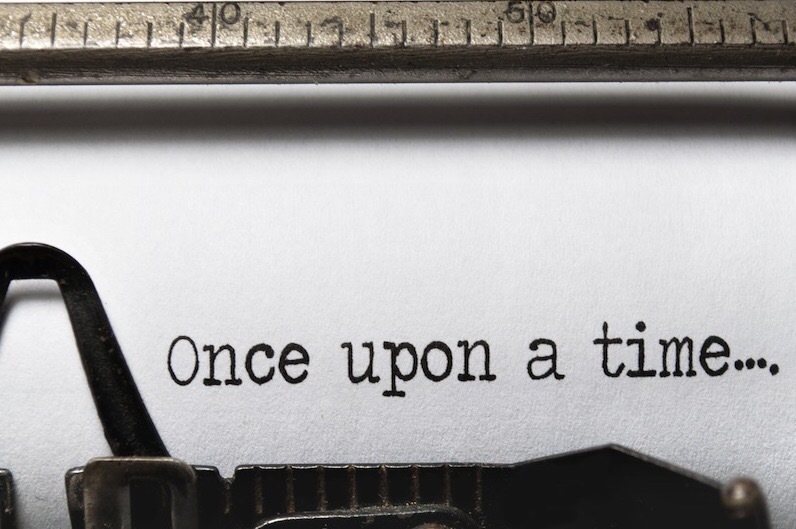 The way to keep a story around for everyone’s enjoyment is not to freeze it in time, but to retell it, add details relevant to today’s audience and drop the bits that no longer apply. It can be painful for those of us who already have a favorite version, but look at it this way: Are we guaranteed to get a better retelling every time? No. But we will get one that continues living, even when that means changing the lyrics and music to the songs from Annie, or taking the trip to Mars out of Total Recall (I did grieve for that one.) What you are witnessing is the growth of living, breathing stories. Oddly enough, it takes our stories longer to evolve, now that they can shoot round the world almost instantly. Back in the day, by the time a story had circumnavigated the globe– and believe me, they did (take a look at Proto-Indo-European mythology, if you don’t)– it looked entirely different. … Sort of like how Dorothy’s fantastic voyage grew from being a simple children’s tale into social commentary on terrorism. For those not in the know (at this point, how could you NOT be??? ), my husband designs card games. He has been at it for a couple of years as an amateur, and recently designed a game so fun, so family-friendly, and so awesome that his publisher couldn’t turn him away. In short, his first game was published at the beginning of this year. It’s called Spy Guys, and I consider it a cross between Memory and Gin Rummy, only with cuter artwork. My mother would have loved it. Hell, *I* love it, and not just because Honey designed it. He, however, never describes it as a cross between Memory and Gin Rummy, probably because he was never so consistently trampled by his mother at playing Gin Rummy as a child, because his mother is a Wolf, not a Card Shark. But that’s not why I was telling you this. Every time we play-tested Spy Guys it was SO HARD to put the game away. “Let’s play it one more time, just to be sure.” We have introduced this game to all of our friends, and the Hensons loved it so much, we sent a pre-production copy home with them, whereupon Eldest Daughter, Age Eight taught it to her grandparents. We even took it to a friend’s game day, where no one else knew Honey yet; where when I mentioned playing it, everyone rolled their eyes. Oh, you think you’re a game designer, do you? And even all of them wanted to play “just one more time.” Because it’s fun! But that’s not why I’m telling you this. Last weekend was Orc-Con. It’s a local gaming convention, here in Los Angeles. (Yeah, I didn’t know there was such a thing, either, until I met Honey.) There are all these rooms for different kinds of games: video games, board games, card games, miniatures games, war games, role playing games (a game-form of storytelling), live action role playing games (same as the latter, only in costume), collectibles games. For these rooms, the publishers and designers take different tables and time slots so that people can come learn about and/or just play their games tournament style. So there’s a slot for Dice Masters, and a slot for Heroclix, and a slot for … I don’t know… Uno. You sign up for what game you want to play, and at the appointed time, you try to trounce your fellow gamers, and there are often prizes for the winners. There’s also a dealer room where you can buy games and fun chatchkies. There’s a flea market where you can buy used games and… weird chatchkies, and pins with funny phrases. (“Anybody want a peanut?”) There’s a library, where you can check out different games, set them up at an empty table, and then either you and your friends, or you and complete strangers who happen to wander by, can play off the clock. There’s even a Paint And Take table, where they will give you a miniature, and you can sit there and paint it and bring it home to either add to your miniatures collection/game or set it on your mantle, center stage, to show off your impressive miniature painting prowess. I made a Scottish Drummer guy (of course! ), but I ran out of time, so he’s on the side of the mantle– that’s for mediocre prowess, you see. But that’s not why I’m telling you this. For the last few years, Honey has been going to a bunch of these local conventions as a volunteer judge. There are a couple of games that are near and dear to his heart, and Honey is the kind of guy that Just Knows all the rules to his favorite games, no matter how complicated they are. He’s also fair and honest to a fault, so he’s kind of perfect for judging. 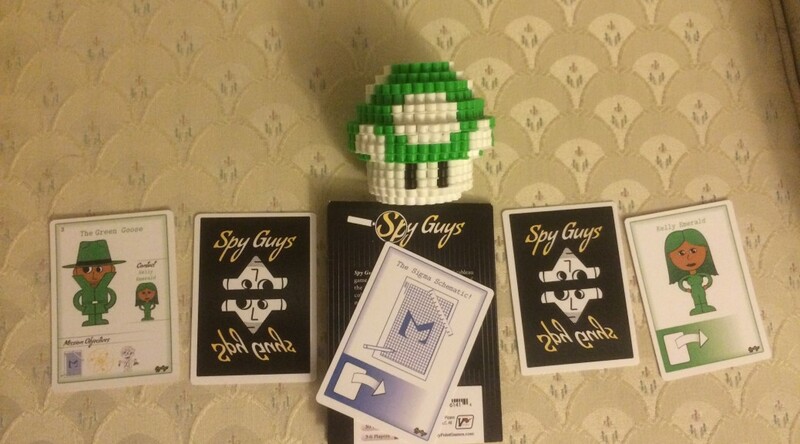 This last weekend, he judged both of his regular games, and then… ran a demo of Spy Guys, which was awesome!!! We had six times the number of people show up for Spy Guys as for the other games he ran that weekend, and they were all strangers. And they all enjoyed themselves. YAAAAY!!!! And here’s why I’m telling you all this: I forgot to take any photos. At. All. You’ll have to trust me. It was awesome. Like Legos. PS I might have forgotten to take any pictures, but I did pick up a 1up mushroom. Does that count? PPS You didn’t think I’d forget the plug, did you? Pick up your own copy of Spy Guys at the Victory Point web site or on Amazon (but Honey gets a better commission if you buy straight from VP.) AND just to entice you, the game is currently for 3-6 players, but he is about to release an expansion pack featuring a two-player option, as well as some Lady Spies! Sa-WEET! Honey doesn’t like pumpkin. Like, he just won’t touch it– pie, bread, muffins, cookies, drinks– any of it. So, while I could make pumpkin baked goods (and share their awesomeness with you), they won’t get eaten very fast in my house. I’m hungry, but I’m not that hungry. And while I could bring pumpkin goodies to the office, I’d prefer to make something that Honey can enjoy too.